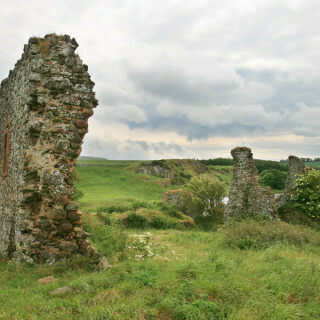 Almond Castle, formerly known as Haining Castle, is a ruined 15th century tower to which additions were made in the 16th century. 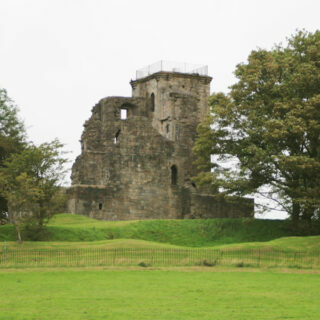 The earliest recorded reference to the then Haining Castle is from 1425, when it was owned by the Crawfords of Haining. 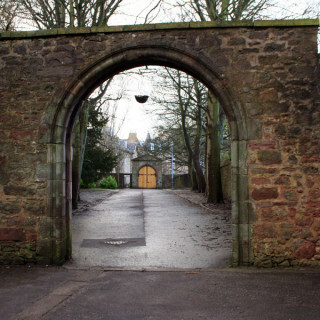 It is likely that it was built some time not much earlier by a Crawford, perhaps William de Crawfurde de Manuel, who owned the surrounding barony of Manuel of which Haining Castle was the principal seat. William de Crawfurde de Manuel appears in written records as early as 1417. Originally built on an L-plan, the main block is rectangular aligned approximately east to west, with a smaller wing projecting from the east end of the north wall. Both have walls around 2.1m thick at ground level, and rise to a height of four storeys plus a garret. 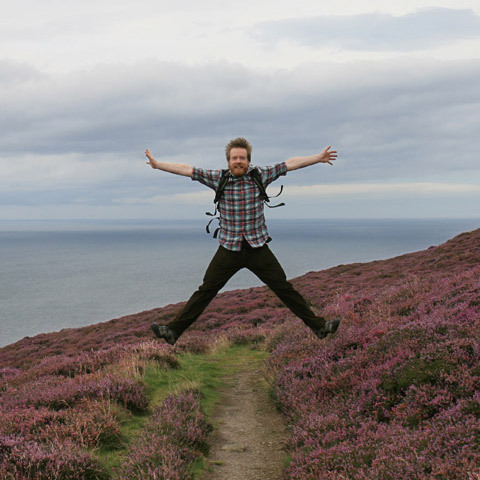 Standing on gently rising ground, the castle was once surrounded by a ditch, no trace of which remains but which was still around 5 metres wide in 1860. The main entrance is via an arched doorway at first floor level, not within the re-entrant angle as is usual on later L-shaped castles, but in the centre of the long east wall. 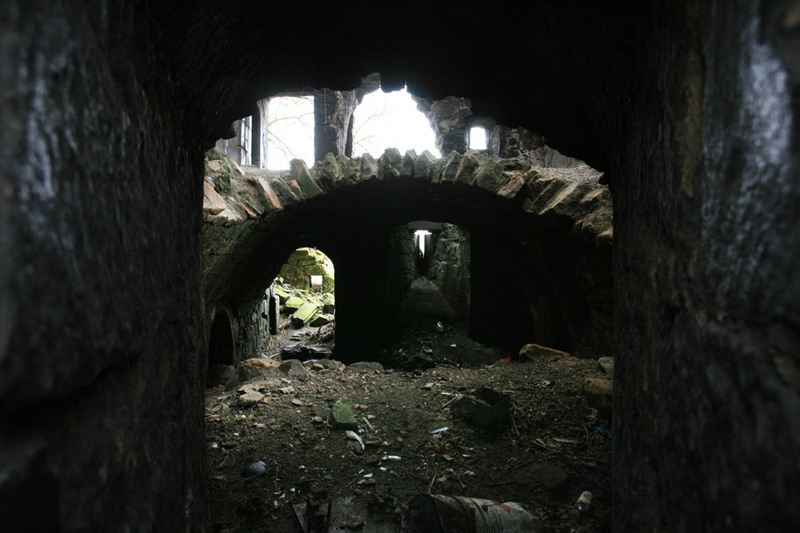 The entrance was protected by a projecting bartizan above, the remains of which can still be seen. 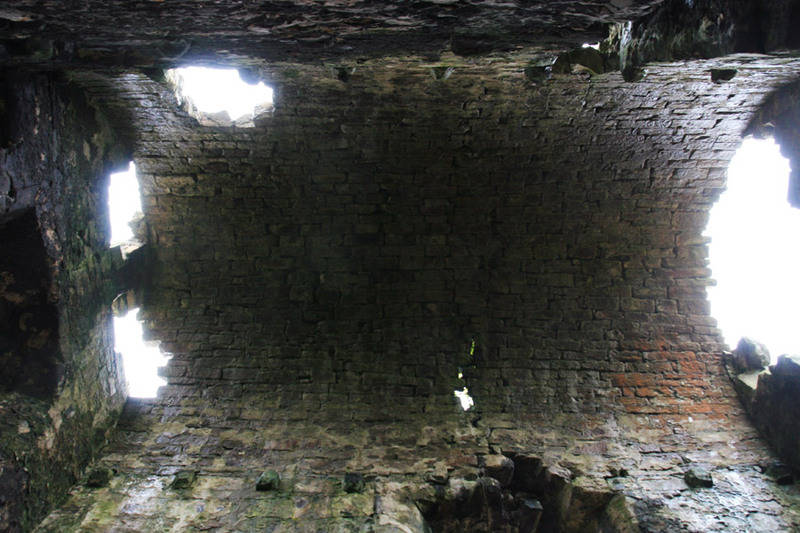 Inside, immediately next to the entrance is a spiral staircase within the thickness of the wall, which gives access to both wings of the tower. 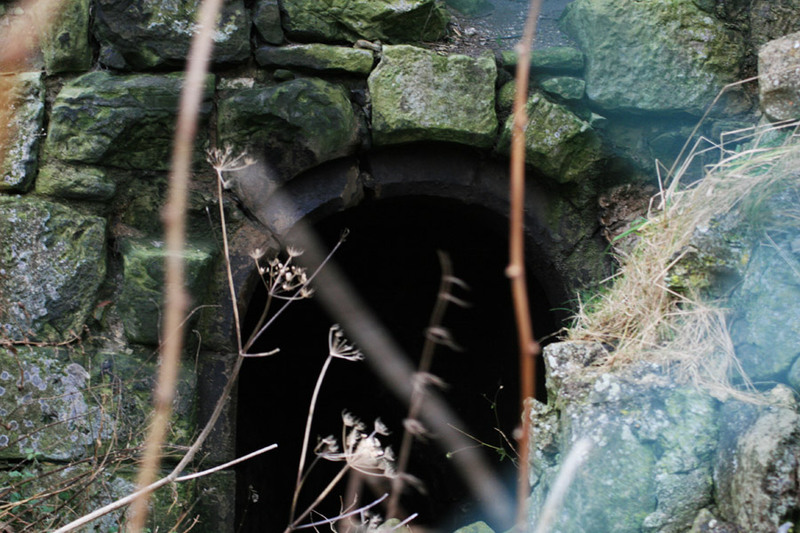 The only access to the vaulted basement at ground floor level, which was divided into one main chamber and a second smaller chamber within the projecting wing, was via a hatch within the recess of the window on the east wall. Part of the basement vaulting has now fallen in, and looking through a small window in the west wall allows a unique view of both the basement and first floor levels. 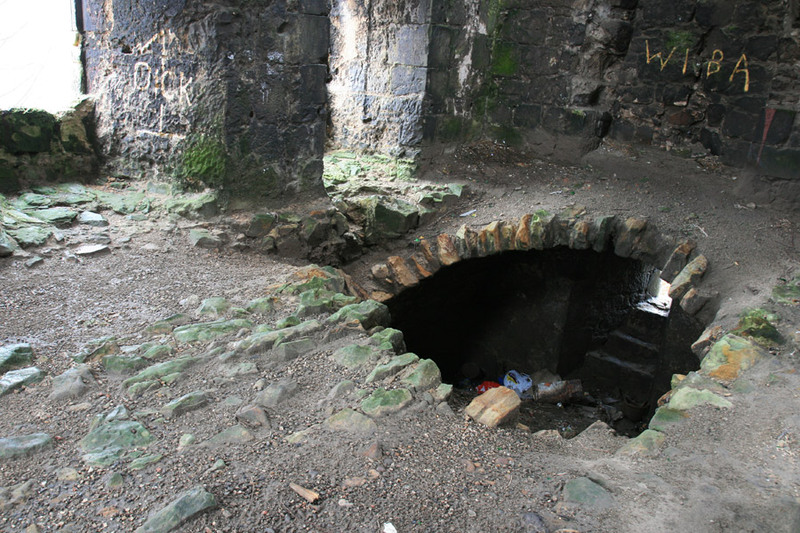 Entering the castle, the poor state of the first storey’s floor can be seen, with the gaping hole into the basement all too apparent. The first floor would probably have housed the main hall, and features large windows with decorative arched surrounds. These would have been opened out at a later date, replacing original smaller, more defensive windows. Above first floor level there are no stone floors, instead each intermediate floor being made from wood, carried on beams inserted into square holes in the walls and supported on stone corbels. 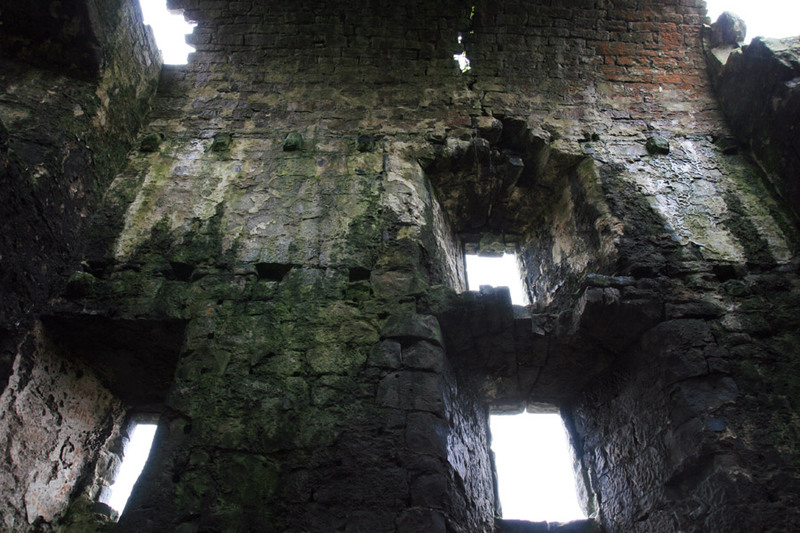 The upper storey is vaulted, suggesting that the roof was perhaps originally made from large stone slabs, as at Craigmillar Castle. 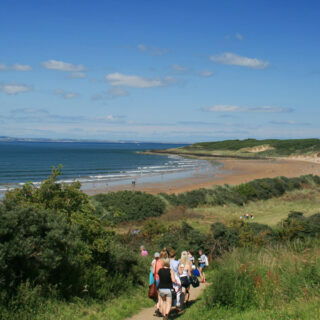 In 1542 Agnes Crawfurd, the elder daughter and joint heiress (with her sister, Margaret) of William Crawfurd of Haining, the last of the male line of Crawfords, married Thomas Livingston, third son of Alexander, the 5th Lord Livingston. 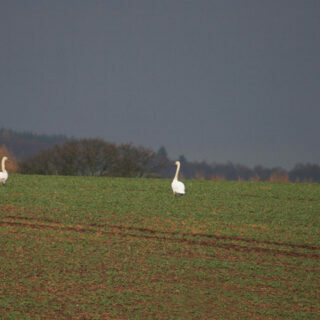 Margaret sold her half of the estate to Agnes in 1551. Thomas is the ancestor of the Livingstons of Haining. Thomas set about improving Haining Castle, updating the accommodation to be more fitting for 16th century living by adding a new wing to the south-west side of the original tower. In 1582 Thomas married for the second time, taking Elizabeth Forrester for his wife. Soon after this another new wing was added, covering the whole of the front of the old castle and extending beyond it to the south-west. 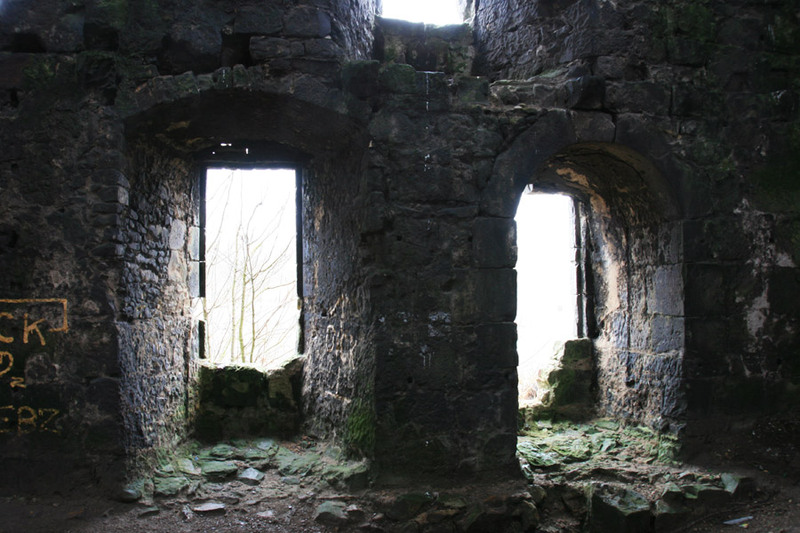 This new wing featured twin narrow rectangular towers, each with a doorway at ground level, flanking a main doorway with wide stairs leading up to a landing, from which more stairs led up right to the first floor and down left to a chamber accessed via the left flanking tower. The right tower’s doorway gave access to a longer chamber at ground floor level, at the end of which was a spiral staircase seemingly accessed not from within the chamber but from outside. The first floor of this wing was divided into two main chambers either side of the wide staircase, and the aforementioned spiral staircase gave access to a further storey above. Little of this wing survives above ground floor level, although a section of wall associated with this addition can be seen high on the original tower. A heraldic panel, which has been moved to Gilmeadowland farmhouse, confirms the probable date of 1586 for the completion of works, and was probably situated above the new doorway. 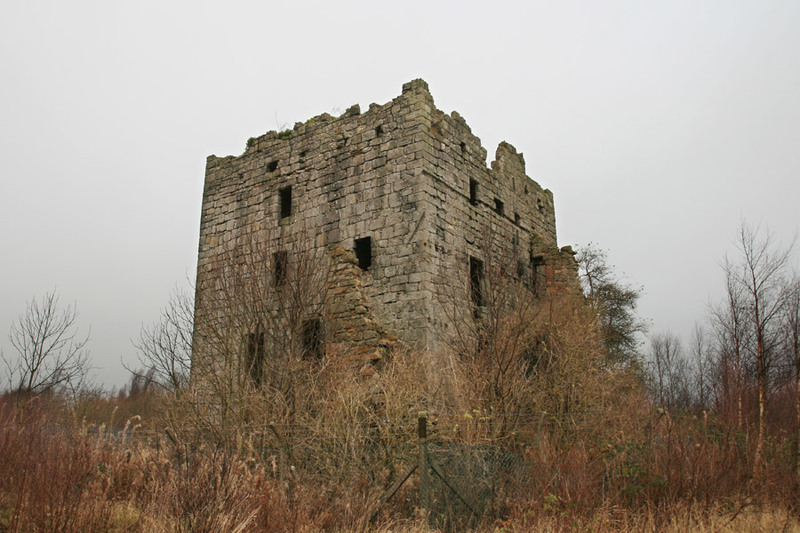 Thomas Livingston was still alive as late as 1606, but by 1640 Haining Castle had passed to Sir James Livingston, son of Alexander Livingston, the 1st Earl of Linlithgow, and grandson of Thomas’ brother William, the 6th Lord Livingston. 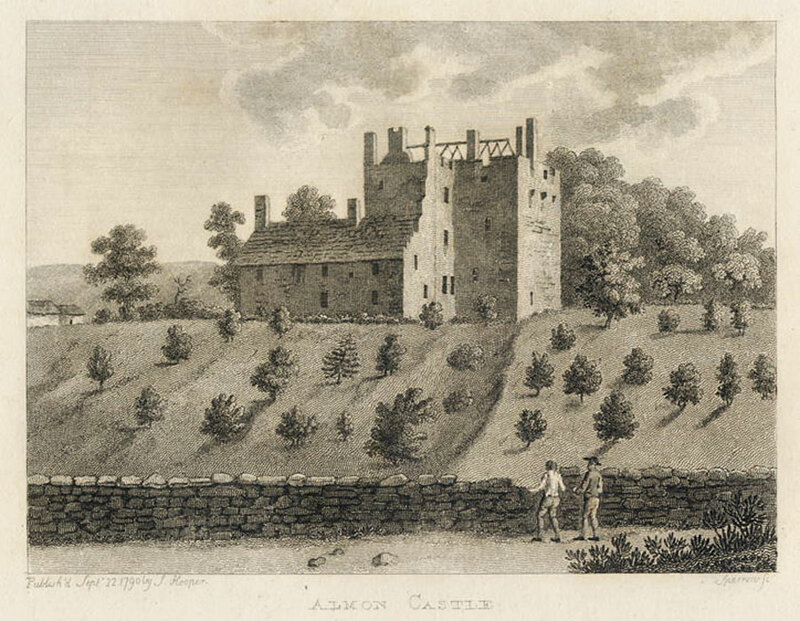 Sir James had been given the title of Lord Almond by Charles I in 1633, and when he inherited Haining Castle he changed its name to Almond Castle, the name by which it is now more commonly known. In 1715 James, the 4th Earl of Callendar and 5th Earl of Linlithgow, joined the Jacobite Rising with 300 of his retainers, and as a result the Livingston seats of Almond Castle and Callendar House were forfeited. The York Buildings Company bought Almond Castle and Callendar House from the Government in 1720. 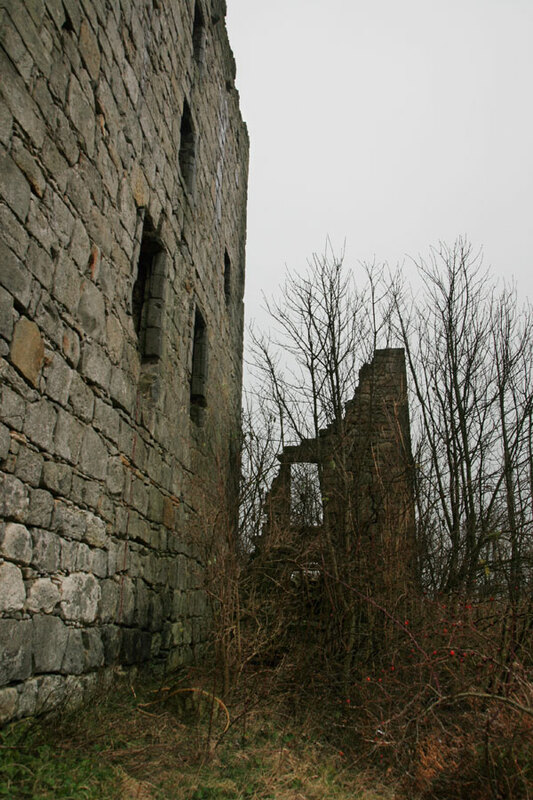 Although it is unclear what they did with the Almond Caste, it was apparently let to tenants until it was abandoned as a place of residence around 1750, and fell into ruin. When the York Buildings Company went into liquidation in 1783, the now ruinous Almond Castle was sold to William Forbes, an Aberdeenshire copper merchant who also bought Callendar House. 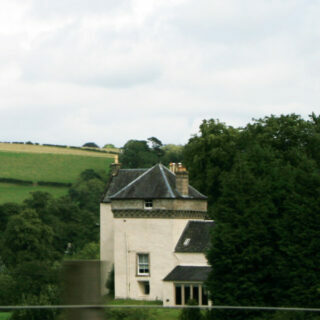 The Forbes family made Callendar House their home, and little seems to have been done with Almond Castle, which by 1790 was a substantial ruin. By the time MacGibbon and Ross visited in 1892, the ditch around Almond Castle had gone, and the castle stood surrounded by farmland. 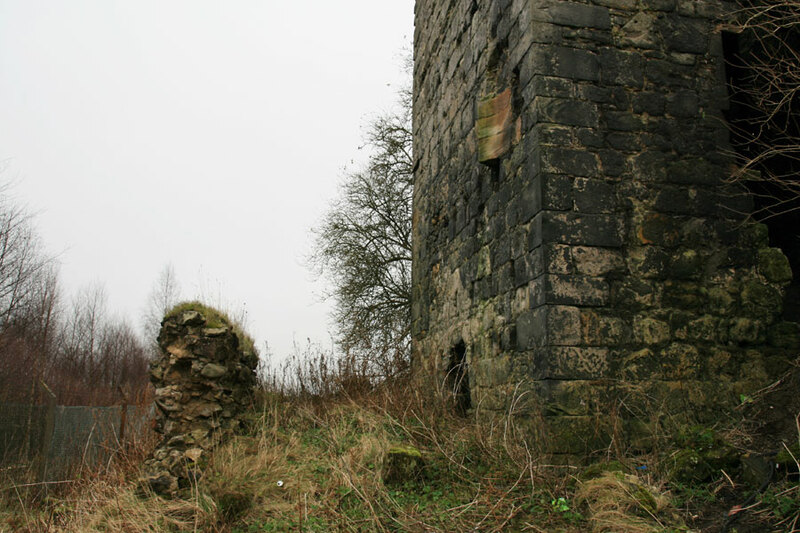 As late as 1958 the castle was apparently still surrounded by fields, however a brickworks was built, and the castle eventually found itself fenced off within an industrial estate. 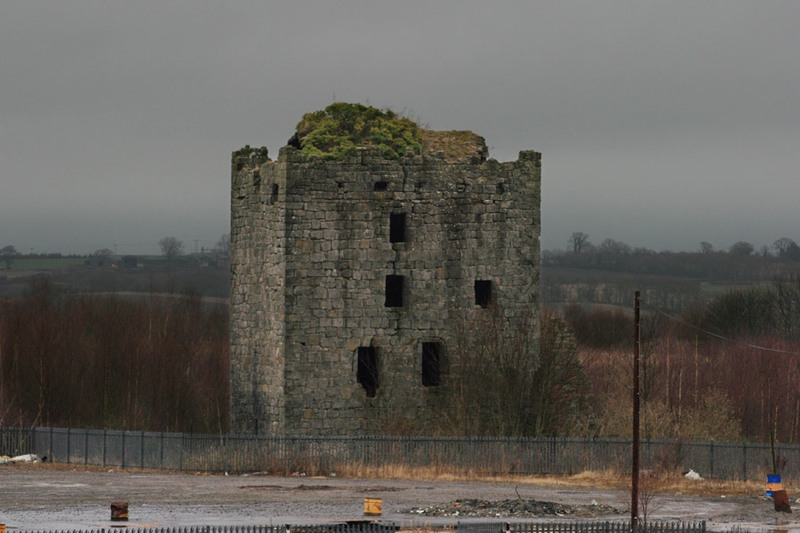 Whitecross Industry Park has now closed down and all the buildings have been cleared, leaving the castle once again out in the open, although surrounded by concrete platforms rather than fields. 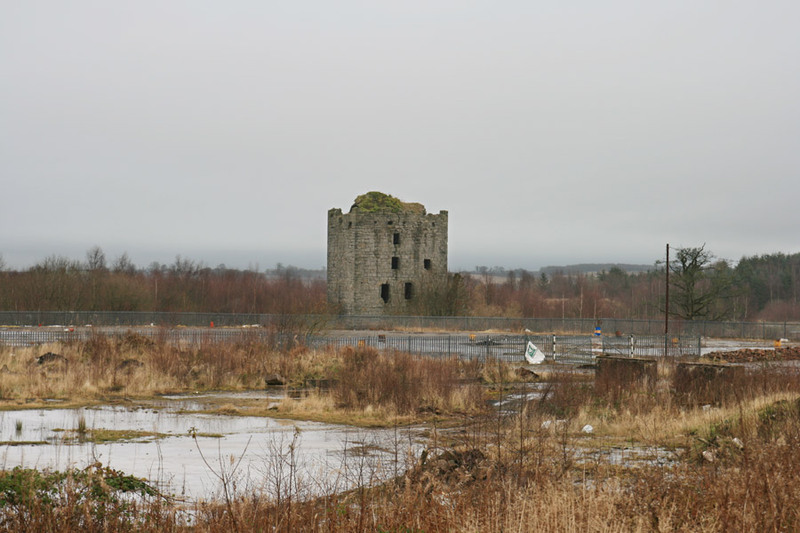 The former industrial site has been the subject of a planning application which would see the castle forming the centre point of a large residential development, although nothing has yet been built. Almond Castle is a very substantial ruin, but it is in danger of deteriorating, with several holes in the vaulted roof weakening the structure. Almond Castle is in the parish of Muiravonside and the county of Stirlingshire. Published on the 27th of January 2012 at 12:50 am. Updated on the 17th of January 2013 at 12:06 am.